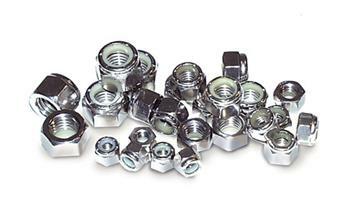 For high stress, high temperature and severe vibration – all metal six point Jet-nuts and 12-point K-nuts are ideal for use practically everywhere. Features include elliptically offset, light weight, temperature resistant, positive locking and almost indefinitely reusable. The upper portion of the nut is distorted or offset elliptically. The elastic deformation creates a friction hold sufficient to lock the nut. Made of carbon-alloy steel, cadmium and chromate finish.